It's been so enjoyable to watch you become more interactive with people and your environment...I love it! Some of your favorite things are: your keys, pulling of my glasses, pulling Mom's hair, and watching a music video ("New Soul," by Yael Naïm). 1) Your hair holds a curl. 2) You like turn and see who is holding you, which can surprise the person who is holding you! 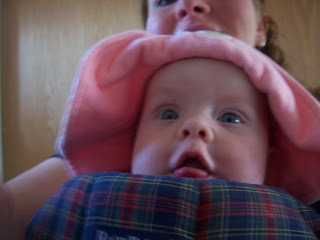 3) Sitting in a high chair is exciting when you can play with a frozen burrito. 4) When I go through the mail, you're my best helper, especially with envelopes that have that clear plastic address window. 5) It's cool to see your face light up when you reach for things. 6) Your abs must be getting stronger because you pull up your feet to your mouth...without using your hands! 7) Rice cereal is not your favorite thing. Nope, not even close. 8) You have become an expert Baby Björn traveler. 9) I watch you for a few minutes as you are sleeping when I leave for work in the morning. 10) Your arms and legs flap when you're excited. George LOVES that music video, too. That is funny. About the rice cereal, Georgie liked it the first few times and then decided he hated it. I just figured he'd come around one of these days (and I knew he was getting enough nourishment from breastfeeding) so I didn't force it. And about a month later we tried again and it went much better.